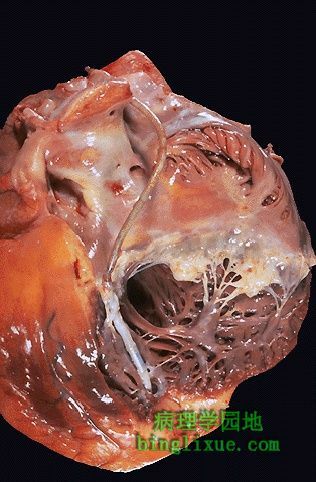 This section of myocardium demonstrates amorphous deposits of pale pink material between myocardial fibers. 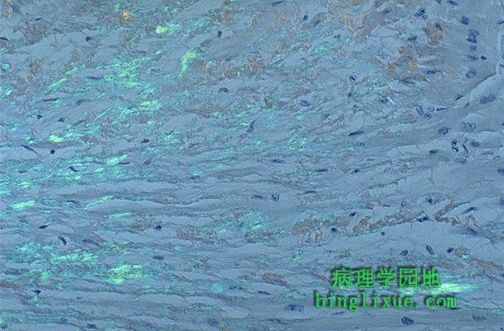 This is characteristic for amyloid. Amyloidosis is a cause for "infiltrative" or "restrictive" cardiomyopathy. It is a nightmare for anesthesiologists when intractable arrhythmias occur during surgery on such patients. 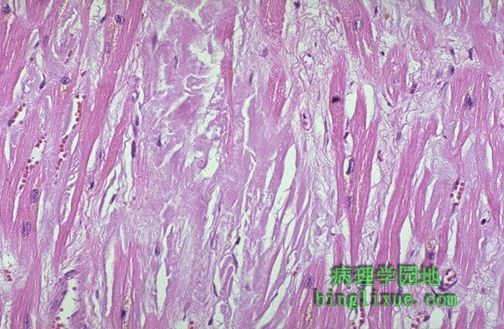 A Congo red stain has been performed on the myocardium in a case of amyloidosis. The amyloid stains orange-red, but with polarized light, the amyloid has an "apple-green" birefringence as seen here. The left ventricle is markedly thickened in this patient with severe hypertension that was untreated for many years. 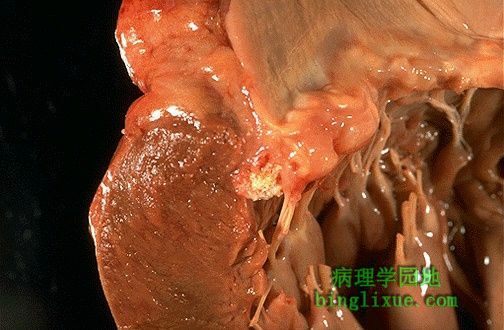 The myocardial fibers have undergone hypertrophy. 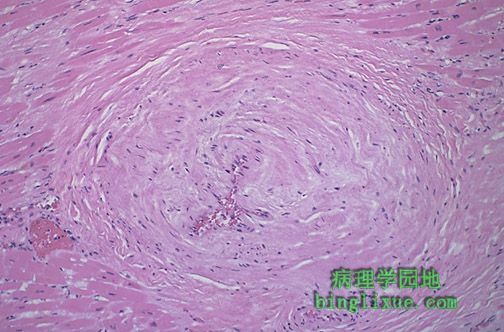 The peripheral coronary arteries may undergo sclerosis, as seen here in an artery branch with a very small lumen, with chronic hypertension. 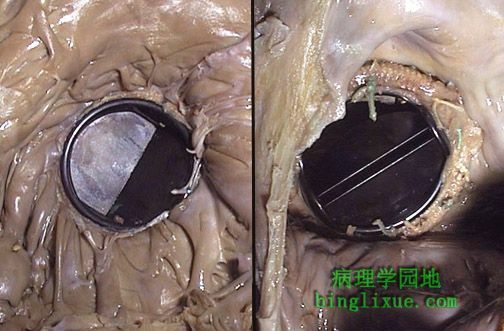 The right ventricle and atrium are opened to reveal a pacemaker wire that extends to the apex to embed on the septum. Pacemakers aid in maintaining a rhythm in hearts prone to arrhythmias. This is an excised porcine bioprosthesis; the undersurface is at the left and the outflow side is at the right. Note there are three cusps sewn into a synthetic ring. The main advantage of a bioprosthesis is the lack of need for continued anticoagulation. 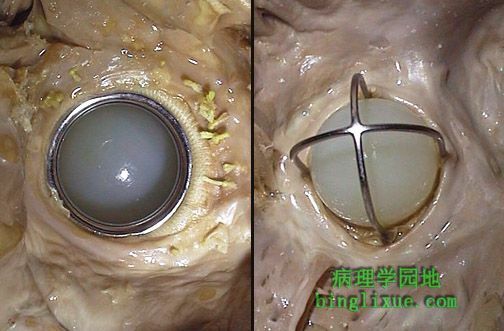 The drawback of this type of prosthetic heart valve is the limited lifespan, on average from 5 to 10 years (but sometimes shorter) because of wear and calcification. This is a mechanical valve prosthesis of the more modern tilting disk variety. Such mechanical prostheses will last indefinitely from a structural standpoint, but the patient requires continuing anticoagulation because of the exposed non-biologic surfaces. The superior aspect (here the left atrium) is seen at the left, while the outflow, with the two leaflets tilted outward toward the left ventricle, is at the right in this mitral valve prosthesis. This is a mechanical valve prosthesis of the older ball and cage variety. Such mechanical prostheses will last indefinitely from a structural standpoint, but the patient requires continuing anticoagulation because of the exposed non-biologic surfaces. The superior aspect (here the left atrium) is seen at the left, while the outflow is at the right into the left ventricle in this mitral valve prosthesis. Thrombosis: this is a major potential problem with mechanical heart valves, requiring that the patient remain on anticoagulant therapy, though this will not entirely prevent thrombosis and subsequent embolization. Structural failure: this is a major problem with bioprostheses, because the leaflets tend to become stiff and calcify. Disproportion: the prosthetic valve may not fit well in the heart, so that blood flow is not optimal. A relatively benign and not too common condition that may show up on radiographic studies is mitral valve ring calcification. 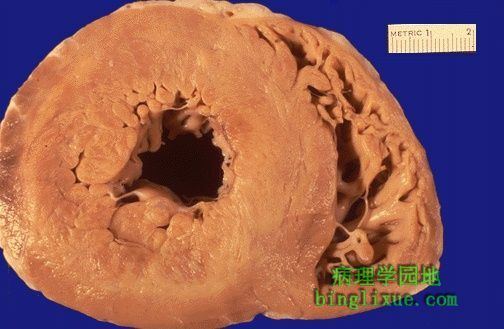 This produces a doughnut-shaped ring of calcification around the mitral valve annulus. The white circle here represents such a ring that has been sectioned as the heart was opened.